Like a comic book superhero, mild-mannered Boris Gulko turns into The Incredible Gulko at the chessboard. Not only does the grandmaster from Fair Lawn NJ boast a lifetime plus score against Garry Kasparov, Gulko has also posted a combined record of 8-0-0 in the United States Chess League. His latest victim was FM Tommy Bartell whose Philadelphia Inventors were outsmarted by the New Jersey Knockouts, in week nine of the USCL. (1) Instead of 12...Qg5, I might have played 12...Qh4+ 13.g3 Qh6 which takes away the g3 square from White's queen. (2) After 15.Be2, my 15...h5 weakened the g6 square. So I should have played 15...Nbd7 16.h4 Qh6 17.g4 g5 18.Qg3 Ke7 with the idea of 19...Rxh8. These three pix were taken by me on Sunday at the ICA Fall 2009 Open, in addition to the photos at the ICA website. The players in the open section prepare for the first round, as TD Lawrence Constance speaks with a chess parent. Andrew Ng defeated William Dubinsky, in round four. After the tournament, blogger John MacArthur enters data into his laptop. MacArthur is flanked by two chess students who participated in the open or scholastic section. At Jim West Talks Chess, I have a new post on corner stalemates. Here is a drawn game, featuring the 4...b6 line in the Fajarowicz variation of the Budapest defense. Yesterday, at the ICA Fall 2009 Open tournament in Hackensack, I finished with a score of 3-1-0. Here is my win on time forfeit from the first round. My opponent found an ingenious way to draw but fell a few seconds short. 68.Kg1 Bg4 69.Kh1 Bf3 70.Kg1 Ke3 71.gxf3 Kxf3 72.Kf1, White forfeits. On October 27th, at the Marshall Chess Club, grandmaster Michael Rohde will lecture to adult players on the Golden Age of Chess from 1990 to 1998. This was a time when tournaments were aplenty, FIDE still had a constant world championship system in place, and computers were best used as a place to pile chess books rather than refute them. GM Rohde has many tournament victories to his credit. He finished equal first at the World Open in 1981 and 1989, and again at the U.S. Open in 1991 and 2007. 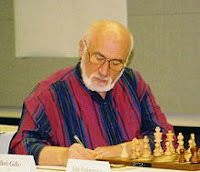 From 1991 to 2006, Rohde authored the Game of the Month column in Chess Life magazine. The lecture begins at 7pm and is free to club members ($10 non-members). The Boston Blitz were strangled by the New Jersey Knockouts, in week eight of the U.S. Chess League. Two Victories @ "Contre Gambit Philidor"
At his Contre Gambit Philidor website, Frederic Fournier has provided a link to my victories against Alisa Melekhina and Rusudan Goletiani. Like John Moldovan of The Chess Coroner, I buy the Newark Star-Ledger on Sundays for its weekly chess column by Steve Doyle and Peter Tamburro. Twice in the last month, the "ChessMate" column has been omitted with a note that it will return next week. Moldovan has sent an e-mail to the newspaper, complaining about the chess column's absence. Judging by the response of the assistant managing editor Enrique Lavin, hardly anyone else complained. Here is Lavin's e-mail address: elavin@starledger.com. Speaking of e-mails, Atomic Patzer has sent me one, advising that this Saturday's quads in Hamilton have been cancelled because the township needs the tables for one of their events. You might want to contact TD Ed Sytnik at his cell phone number 609-351-2437 before driving to Hamilton on October 24th. The Dean of Chess Academy has moved to its new location: 3150 Route 22 West/Branchburg, NJ 08876, phone number 908-595-0066. In his Wall Street Journal column, Garry Kasparov states his opinions on Iranian oil and political rhetoric. Seeing these glamorous photos called to mind a couple of my victories in the PCG. 49.Kc3 Kf3 50.b3 axb3 51.Kxb3 Kg2 52.Rxh2+ Rxh2 53.Kb4 Kf3 54.a4 Ke4 55.a5 Kd5 56.Kb5 Rb2+ 57.Ka6 Kc6 58.Ka7 Rb7+ 59.Ka6 Rb5, White resigns. 26.g5 Ref8 27.g6 hxg6 28.Qxg6 Qxe3+ 29.Kb1 Qxf4 30.Rh1 Qf5, White resigns. In yesterday's game/30 Swiss at the Marshall Chess Club, I finished with a score of 3-1-1. Here are my games as Black. 43.Qxa6 Qb1+ 44.Kf2 Qf5+ 45.Ke3 Qe5+ 46.Kf2 Qf5+ 47.Kg1 Qc5+ 48.Kf1 Qf5+ 49.Ke1 Qb1+ 50.Kf2, draw. 22.cxd4 Bxa2 23.dxe5 Bd5 24.f5 Bb4 25.Ne4 Qxe5 26.f6 Bxe4 27.Qxe4 Qxe4 28.dxe4 Rxf6 29.Rb1 Bc5+ 30.Kh1 b5 31.h3 Re6 32.Rc1 Bd4, White resigns. Here is a video showing photos of Bobby Fischer's visit to the Philippines in 1967. In week seven of the U.S. Chess League, the Baltimore Kingfishers were downed by the New Jersey Knockouts. The victory guarantees the Knockouts a playoff berth, for the first time in their history. Here is a video of a chess simul in which many of the moves were...well, canny! The simul was given in Washington Square Park by an unnamed grandmaster, wearing an AMP can. In a Wall Street Journal article, Barbara Jepson argues in favor of abolishing women's titles in chess. These are photos that I took on Sunday at the Marshall Chess Club October Under 2300 tournament. This picture shows the upstairs room before the start of the one day schedule. Between rounds, candidate master George Berg reads a magazine, in the downstairs room. In round three, FM Boris Privman and Alena Kats played to a draw, on board one. Meanwhile Michael Layevskiy lost to NM Yefim Treger. Here is a shot of the upstairs room before the fourth round. In the final round, FM Boris Privman was defeated by NM Yefim Treger who won the tournament with 4 points. Yankees manager Joe Girardi tells William C. Rhoden, sports columnist of The New York Times, how chess helps inform his decisions on the baseball diamond. Playing in the one day schedule, I finished with a score of 2-1-1 today, in a Swiss tournament at the Marshall Chess Club. After being outplayed in the middlegame, I managed to draw the ending, in my final round game. 48.Rh6+ Kd7 49.Rh7+ Be7 50.Rh6 Bd8 51.Rh7+ Be7 52.Rh6 Bd8 53.Rh7+, draw. On Tuesday, October 13th, senior master Taghian Taghian [pictured above, next to Garry Kasparov] will lecture for adult players at the Marshall Chess Club on two games from the Zurich 1953 candidates tournament. The series is based on The Mammoth Book of The World’s Greatest Chess Games. Taghian will analyze Averbakh - Kotov and Keres - Smyslov. Tag is well known for excellent teaching skills, especially his ability to break down a complex position into basic elements that a novice can comprehend. The lecture begins at 7:30pm and is free to club members ($10 non-members). Bobby Fischer's common-law wife Marilyn and their daughter Jinky will be interviewed in November, for an upcoming BBC-HBO documentary on Fischer. Here is a video of Bobby Fischer's visit to the Philippines, Tokyo, and Hong Kong in 1973. Despite winning their first five matches of the season, the New Jersey Knockouts got caught in a sting operation by the Arizona Scorpions, in week six of the United States Chess League. Kreitner - West @ "Contre Gambit Philidor"
At Contre Gambit Philidor, Frederic Fournier has provided a link to my game against Ilan Kreitner. Tomorrow evening, to assist GM Alex Lenderman in winning the World Junior Championship, the Marshall Chess Foundation is presenting a tandem simultaneous exhibition and lecture by Lenderman and GM Giorgi Kacheishvili, who will accompany Alex to Buenos Aires. The two GM's will alternate moves against their opponents. The simul will be followed by a lecture from both grandmasters. The event will take place at the Marshall Chess Club, starting at 7pm. Book prizes will be awarded to all participants in the simul who win or draw their games. Refreshments will be served. The simul/lecture fee is $25 for club members (non-members $35). This afternoon, I won the following PCG at the Marshall Chess Club. 49.Kf4 d3 50.Rd7 c4 51.a4 d2 52.Ke3 c3 53.Ke2 Rb1, White resigns. Earlier today, I won this difficult game at the Marshall Chess Club. 51.Rg2 a5 52.R8g3 Qh5 53.Rg7+ Kh8 54.Rg8+ Kh7 55.R2g7+ Kh6 56.Rh8+ Kxg7 57.Rxh5, Black resigns. In week five of the U.S. Chess League, the Chicago Blaze got burned by the red hot New Jersey Knockouts. Here is a two-part interview with Garry Kasparov, following his match with Anatoly Karpov in Valencia.